The Pumpkin Spice Latte: A Flavor in Decline? The pumpkin-flavored hype-machine is revving itself into life again, as articles have started to appear everywhere detailing Starbucks’ planned changes to everyone’s favorite Pumpkin Spice Latte. In response to last year’s detailed criticism of transparency in the ingredients for the traditionally-loved pumpkin drink, Starbucks has announced their intention to change the recipe to include real pumpkin, instead of pumpkin flavoring. Keeping with tradition, they also plan to capitalize on the seasonal nature of the beverage, leveraging its limited-time availability to build buzz about the beverage well before the product becomes available. Search traffic is down for all branded Pumpkin Spice lattes. This trend was apparent in our data as well, but raises doubts about the overall dominance of seasonally-popular beverages. Year-over-year search data suggests that pumpkin spice continues to suffer from the negative ingredients coverage from late 2014. 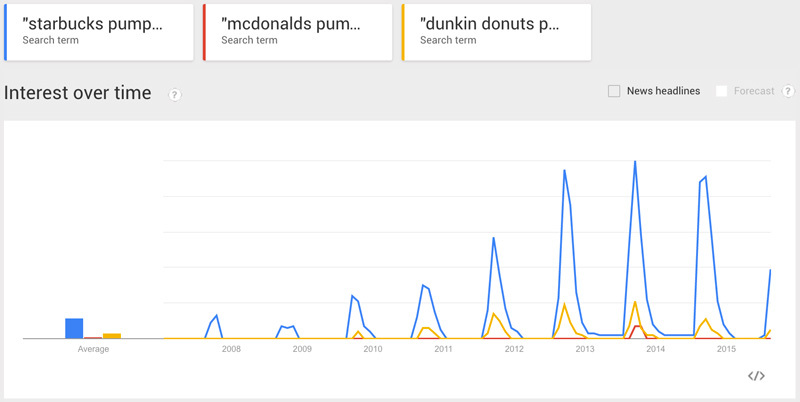 Significantly, search traffic is on the decline for each branded version of Pumpkin Spice Latte, demonstrating similar trends for Dunkin’ Donuts and McCafé instead of remaining unique to Starbucks’ version. On social media, Starbucks has seen sporadic interest year-over-year but similar to trends in search traffic, also received lower conversation volume in 2014 than in 2013. Mimicking the trend for search volume, post volume is down year-over-year for each brand, instead of applying only to one brand. Can a Naturally-Flavored Pumpkin Spice Latte Re-Energize the Category? On August 17, Peter Dukes, Starbucks’ Director of Espresso and Brewed Coffee Americas, released a post in which he detailed the new changes planned for their version of the Pumpkin Spice Latte. Starbucks’ came under fire last year for their lack of transparency regarding their ingredients list for the pumpkin-flavored beverage. Dukes’ post seems to be a direct response to these criticisms. Not only does he list the full series of ingredients to be used this fall, but details that the “pumpkin spice flavored sauce” includes real pumpkin in the form of pumpkin puree. Fortunately for Starbucks, the excitement seems to be building in its favor once more, and the brand’s competitors’ beverages are again receiving much less press coverage by comparison. To better understand consumer opinions of the pumpkin spice latte flavor, we examined social data over the past five years to pinpoint opportunities that might exist moving forward. In our report, Social Media Insights for the Pumpkin Spice Latte, we provide an in-depth examination of analyzing social data to provide strategic value for the coffee shops and competing branded products. 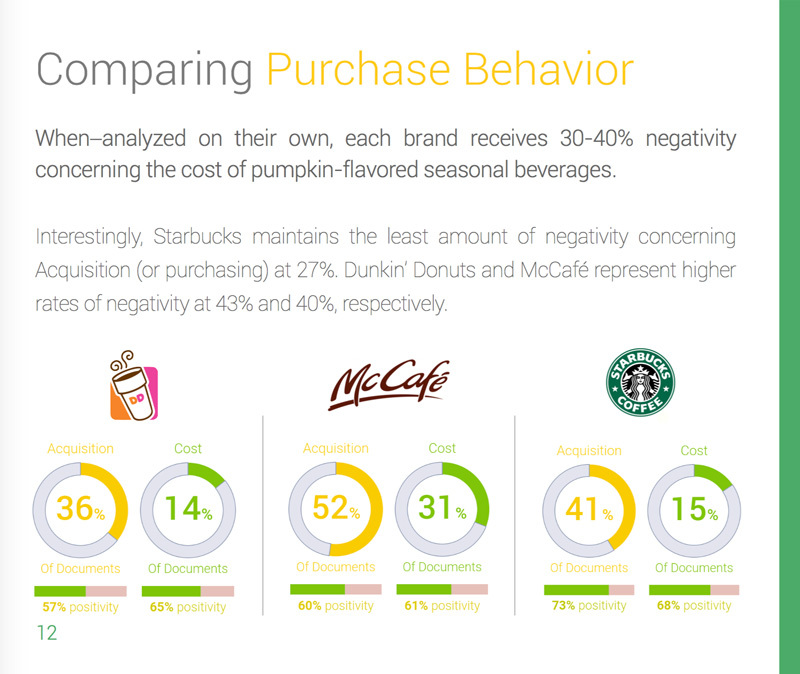 This report provides a look at the narrative behind seasonal beverages, highlighting the opinions consumers hold of the pumpkin spice flavored latte offerings from Starbucks, McDonald’s and Dunkin’ Donuts.